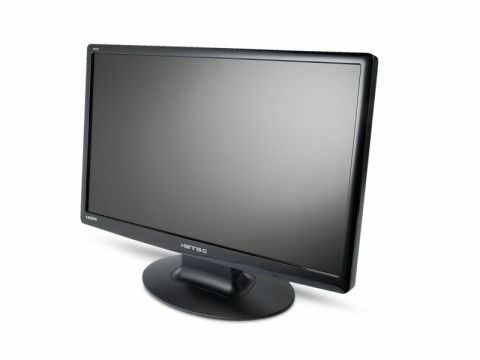 The Hanns.G HH251HP panel we're reviewing here punches below the standard price-point for 24inch monitors and gives you another inch of displaying goodness into the bargain. Screen real estate is always a bonus and, with the HH251HP displaying at a native resolution of 1920x1080, you've got a whole load there for your computing pleasure. This widescreen nature means that in productivity, gaming and movie-watching, you're going to be benefiting across the board. Indeed, there's no other PC component/peripheral that you're going to get as much satisfaction out of, on such a regular basis, as with a decent monitor. In hitting that price-point, however, there surely has to be a catch, doesn't there? Well, if you're a designer after a beautiful panel with perfect colour saturation and ideal white/black balancing, then this isn't going to be the panel for you. But then, you already knew that didn't you? You knew you were going to have to be selling a kidney for a lovely PVA panel, after all. But if you're an average Joseph with a penchant for large desktops, then the Hanns.G is worth a punt. Obviously this TN panel has its flaws, though; the touted Hanns.G exclusive X-Contrast technology does nothing good for the screen's contrast. I had to set the standard setting to full with our test images to be able to distinguish the darker greys from the blacks and, with the X-Contrast tech turned on, the screen went so dark I could hardly make out the lightest colours. There's a certain amount of pollution in the white/black gradients too, and the colour saturation isn't too hot at even fairly standard viewing angles. That said, the Hanns.G offers a lot of monitor for not very much money. There are comparable screens out there for the price, but none at this particular size. The HH251HP is well appointed too; the sleek, glossy black surround is non-intrusive and it also comes with a decent array of inputs. The speakers, typically, are fairly wimpy and the stand is simple plastic fare, but those are places I really don't mind expense being spared. The twin HDMI ports and lack of DVI had me briefly baffled, but the enclosed HDMI to DVI cable quickly made sense of that and offers multiple connectivity right from the off – something that few equivalently priced panels do. And therein lies the rub, this Hanns.G offers something few others do – and that's reason enough for me to heartily recommend it.